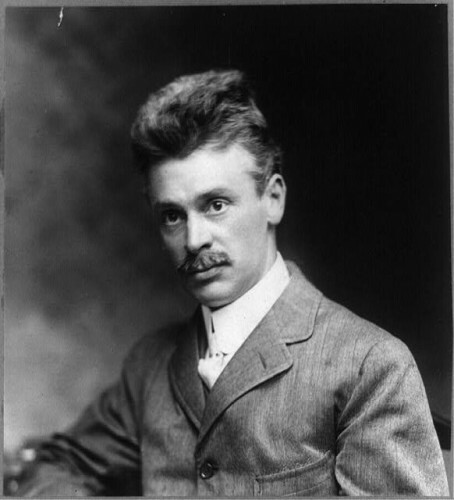 Engineer, scientist, inventor, and hobbyist Hiram Percy Maxim earned patents for his inventions in automotive design, noise abatement, and other fields. Also a passionate hobbyist, he left his mark on early aviation and wireless radio. Maxim’s broadly recognized achievements brought fame to Hartford, where he made his home from 1899 until his death in 1936. Born in Brooklyn, New York, on September 2, 1869, to a family of inventors, Hiram Percy Maxim would later be mistakenly identified with the lethal weapons his relatives created. His father, Sir Hiram Stevens Maxim, had invented the portable machine gun, and his uncle, Hudson Maxim, had created new explosives and propellants. Maxim attended Brooklyn schools and the Massachusetts Institute of Technology, from which he graduated in 1886. Being only 17 years old, he was the youngest member of his class. After graduation, he worked for several electric companies in Boston. In December 1898, Maxim married Josephine Hamilton, the daughter of a former Maryland governor, and moved to Hartford. The couple had two children, son Hiram Hamilton and daughter Percy. A Hartford socialite and activist, Hiram’s wife Josephine did not lack for accomplishments of her own. She was the first Connecticut woman appointed to the Democratic National Convention, sat on the Hartford Board of Education, served on the executive committee of the Connecticut Woman Suffrage Association and founded the Connecticut League of Women Voters. As the automobile evolved in the early 20th century, inventors in the United States looked toward to battery-driven vehicles as the future of transportation. A number of small firms throughout New England produced these early electric-powered vehicles. Among them was Albert Pope’s Columbia Automobile Company of Hartford. Maxim, however, found the idea of a gasoline-powered engine intriguing and in 1899 the Columbia Automobile Company adopted his pioneering concept, which evolved from an engine-driven bicycle to an engine-driven, four-wheeled vehicle. Maxim’s design would become the Columbia Gasoline Carriage. Built in Hartford, the vehicle was one of the first of its kind manufactured in the world. Maxim promoted motor touring and affiliated himself with many touring clubs in Hartford. Maxim’s interest in automobiles never waned and he patented many automotive-related inventions during his lifetime. Gradually, however, he devoted his attention and skills to other problems of modern life. His work on silencing devices for motor vehicle exhaust systems brought him recognition as a scientist—and prominence in another field, acoustics and sound abatement. In 1908, he patented a unique weapon silencer (called the Maxim silencer), a practical application of his research. He went on to develop silencers for diesel and gasoline engines, air compressors, air conditioning, and other applications which are still utilized today. An avid hobbyist, Maxim’s pursuits led him to other distinctions. As a pioneering glider enthusiast, he owned one of the first aircraft seen over Hartford and helped found the Aero Club of Hartford. Recognizing the phenomenal growth potential of aviation and, in particular, the advantages of reliable air mail service, Maxim positioned Hartford at the forefront of this new trend. He served for many years as chairman of Hartford’s Aviation Commission and was responsible for the establishment of Hartford’s initial municipal aviation port, Brainard Field. Throughout his life, Maxim’s boundless enthusiasm enveloped many fields but perhaps none as fervently as amateur radio. The Italian inventor Guglielmo Marconi had sent his first signal across the Atlantic just nine years earlier when Maxim, at age 40, learned radiotelegraph code. He and his son built one of the first radiotelegraph stations, distinguished by its powerful spark-gap transmitter and its enormous antennas, in Hartford. 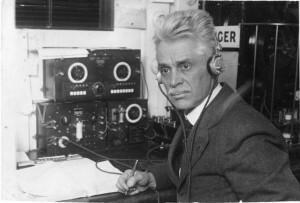 Maxim joined the hundreds of radio enthusiasts intent on communicating with fellow operators. Yet, the signal range of the most powerful of these stations was restricted to communication within about 100 miles. Organizing stations to relay messages provided an immediate solution, as intermediate amateur stations could receive and then retransmit, or relay, messages across the continent. What was needed was an organization that would pull together the amateurs into a strong, self-reliant body. Maxim presented this solution to the Radio Club of Hartford in April 1914, and the club voted to create and manage a relay organization: the American Radio Relay League. Maxim presided over the organization through its embryonic years, and the League today is the national membership association for amateur radio operators. League headquarters are located in Newington, Connecticut, and the operating station there is designated the Hiram Percy Maxim Memorial station with the call letters W1AW, Maxim’s last licensed call letters. Maxim wrote of his youth, his father, and the early days of the automobile. His books and Harper’s Magazine articles were widely read and survive today as memoirs of a unique era. Maxim’s other hobbies and endeavors included yachting, cinema, and amateur wireless radio. Hiram Percy Maxim died on February 17, 1936 of a throat infection. He was returning home from the Percival Lowell Observatory in California, where, true to his style, he was pursuing another of his hobbies, astronomy. Michael Marinaro holds a Masters degree in History and is the Volunteer Staff Historian at the American Radio Relay League, the national association for amateur radio. “American Radio Relay League,” 2012. Link. Maxim, Hiram Percy. Patent Number 1,018,720 - Silencing Device For Firearms. 1,018,720. Hartford, CT, issued February 27, 1912. Link. Maxim, Hiram Percy. Patent Number 594,805 - Motor-Vehicle. 594805. Hartford, issued November 30, 1897. Link. Maxim, Hiram Percy. 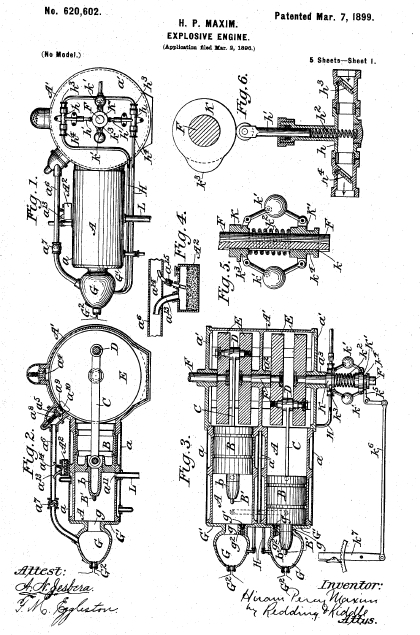 Patent Number 620,602 - Explosive-Engine. 620602, issued March 7, 1899. Link. Alden, H. W., Hiram Percy Maxim, and Harry M. Pope. Patent Number 772,571 - Electric Motor-Vehicle. 772571. Hartford, issued October 18, 1904. Link. Maxim, Hiram Percy. Patent Number 916,885 - Silent Firearm. 916885. Hartford, CT, issued March 30, 1909. Link. Schumacher, Alice Clink. Hiram Percy Maxim. Cortez, CO: Electric Radio Press, 1998. Maxim, Hiram Percy. Horseless Carriage Days. New York; London: Harper & Brothers, 1937. Benjamin Silliman and Soda Water – Who Knew?